Bridge No. 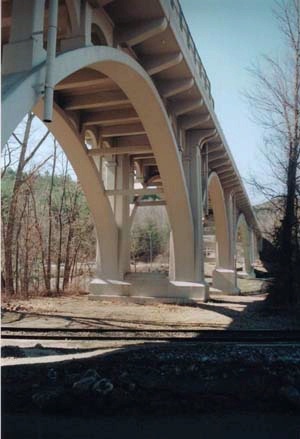 560's six open-spandrel arches span not only the Housatonic River but also the tracks of the Housatonic Railroad and local roads on either side of the river. The arches each consist of a pair of ribs supporting a series of columns, which in turn support floor beams for the 33'-wide roadway. The openings between columns are arched at the tops, and the large piers between arches have decorative recessed panels on their outer surfaces. Originally, the bridge included sidewalks and pedestrian stairways at each end. Modern concrete and steel railings take the pace of the original balustrades. Bridge No. 560 was one of the largest engineering projects undertaken by the State Highway Department in the early 20th century. It served as a vital link in Route 7, the only major north-south highway in this part of western Connecticut, and it also provided a crossing for Route 4, an important east-west route. Its predecessor was an old and narrow wooden covered bridge that crossed the river at a much lower level. By soaring some 50' above the valley, the arches of Bridge No. 560 at once eliminated a railroad grade crossing, improved interchanges with local roads, reduced the possibility of flood damage, and provided a wide, modern bridge for two Trunk Line highways. The bridge was featured as the frontispiece to the Connecticut Highway Commisison’s 1931 Annual Report, and it was one of eight outstanding bridge projects included in the State Highway Department’s 40-year retrospective, published in 1935. 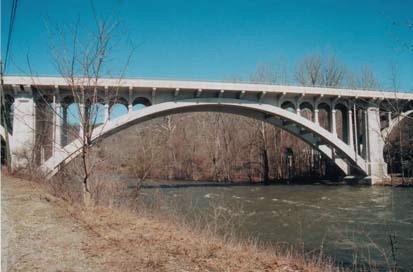 The river span is the longest concrete arch in the state.